Living next door to the post office isn’t so great at 5 a.m. when the mail truck with its back-up beeper delivers Winterset’s mail, but other than that, my home’s location less than five minutes’ walk from the town square is a constant joy. If I need a greeting card, for example, I can scoot up the alley (I think of it as my alley) to Montross Pharmacy, enter through the back door, select and address the card, and mail it on my way back. If I need a box of paper clips, a curtain rod, a lightbulb, or a jigsaw puzzle, Ben Franklin, on the southeast corner of the square, is only a few paces farther. If I need fabric for the quilt I’m working on, Ben Franklin (co-owned by a quilter) or Piece Works (in the storefront that was once Fons & Porter) will have just the thing. 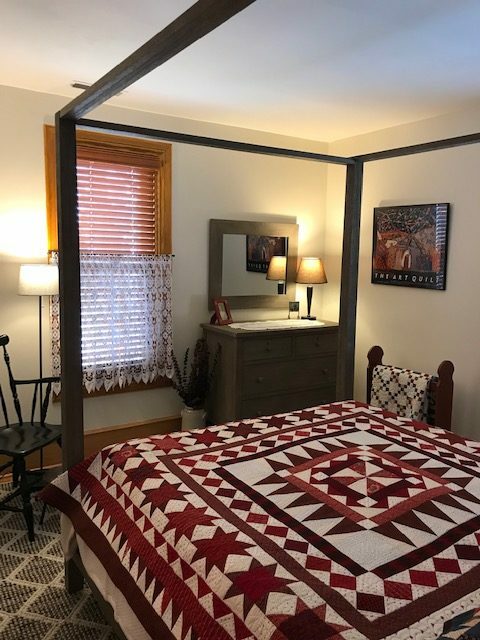 This past winter, Mark and I refurbished two upstairs bedrooms, changing wall colors, shifting beds from one room to the other, making the first updates in over a decade. The first one, once the flowery wallpaper was stripped and walls repaired and repainted, came together easily. My mom’s walnut four-poster, a pair of repurposed sheers, an area rug we owned already—all worked just right. The other room, however, once the new bed and dresser were in place, lacked coziness. The creamy white we chose for the walls felt cold instead of inviting. Putting one of my quilts on the bed was a good start, but accessories were needed. Lucky for me, not one but THREE terrific home decor stores occupy the west side of Winterset’s square, so up the alley I charged. At Pine Creek Ltd., I found the Windsor chair, the footstool, the lamps, everything we needed to make the room just beautiful. And, since this is Winterset, owner Bill Moody simply jotted down what I took away to try rather than have me purchase and return each piece of merchandise. He even let me out the back door to carry home a neat wood bench that turned out to be too short. I brought it back and exchanged it for a longer one. * And, since this is Winterset, I left my purse behind the counter with Bill so I didn’t have to haul it back and forth along with everything else. *Bench not in photo—it’s under a window to the right of the quilt rack. Oh my God! The little town sounds heavenly! Like a town that has remained in the past. Makes me want to move there. Lovely…And fun to do, I am sure! Wonderful job. I will always remember when you came to Kokomo–loved visiting with you and you are such a wonderful, talented person. One of my life highlights. So many heartwarming stories and their footprints through this wonderful town are alley-born; what a blessing for the generations who call Winterset home to listen to the echoes of those footprints. It looks like everything was purchased together. Beautiful! Beautiful and your writing reminds me how nice it was to work on the square at Fons and Porter and walk to coffee shops or lunch! Living in a small down does have its advantages, after all! Like small towns, our small town is getting smaller and there’s no store to leave your purse at. I miss you and wonderful Winterset. Wish you and Mike could come!